The Collective is not just a list of stops. It’s a curated collection to sample. A world-class, estate grown, sustainable winery owned by elegant fashion house Chanel, Inc. The historic tunnels and stately architecture of California’s oldest continually operating winery. The intimate warmth of a dreamy velvet tasting room and the sparkling glow of the extraordinary crystal cellar. Quattro Vino Tours are an indulgence start to finish. Elegant interiors. Rich mahogany. Gleaming brass. Sleek fixtures. Smooth marble. 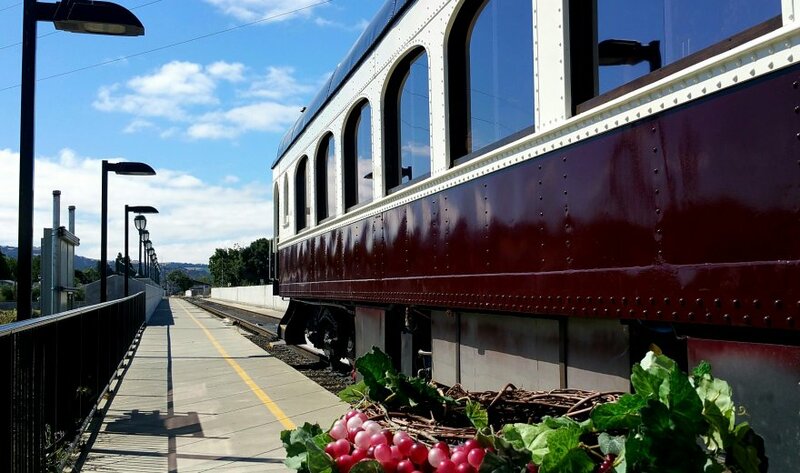 The train car, rattling at an easy pace through extraordinary Napa countryside. Sweeping rows of vines, some there since 1868, whisper stories. By now you’ll have more than a few stories of your own to tell. By the time you come to the end of the line, you don’t want your journey to end. But in a way it doesn’t. Because it’s a trip you’ll never forget. Sparkling wine sets the mood. Lemon mascarpone crepes, roasted maple bacon, and oven basted egg with salmon roe and buttered croutons set your journey in motion. Alongside you, an intimate group of traveling companions, en route to your wine discovery. And unexpected connections along the way. A private tour of a 100% estate grown, sustainably farmed winery is your first stop. The Napa Green Certified St. Supery Estate Vineyards and Winery covers steep rolling ground high in the northeastern mountains of Napa Valley. Get a bird’s-eye- view of the winemaking process. And sample their celebrated full-bodied, robust Cabernet Sauvignon and distinctive Sauvignon Blanc. 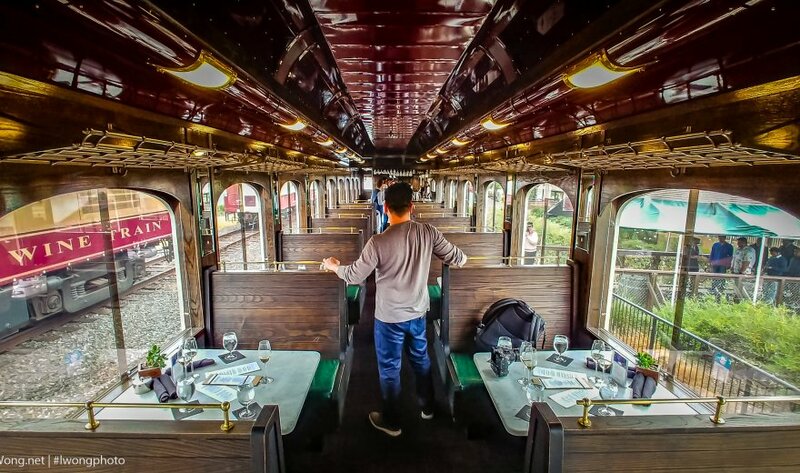 Your epicurious journey continues on board, where cracked mustard-cider glazed salmon or grilled tenderloin of beef with pastrami spices and truffle potato salad are served with your stylish and elegant train as the backdrop. A stately residence. One of the most beautiful properties in California’s wine country. A journey through the Old Winery and the estate’s historic tunnels. A family passionate about the art of winemaking. And it shows. Behind the scenes at Beringer Winery is a bit like traveling back in time. And your final stop, Raymond Vineyards. Considered one of the great estates of Napa Valley, with a collection of wines as exciting as the spaces they’re served in. Your experience begins with the Theater of Nature in the biodynamic gardens. Let your nose do the talking as you identify various aromatics released by wines, all while enjoying Raymond’s select wines. Learn about a grape’s journey from harvest to crushing to aging, all while enjoying Raymond’s select wines. Tour the Crystal Cellar by the soft glow of the chandeliers, and in the Barrel Room, learn how food influences the taste and texture of Cabernet. Inspiring, elegant, creative, and whimsical, Raymond is a feast for all of your senses. The fourth and final course—dessert. Our pastry chef’s daily creation, to be exact. Whether it’s sweet or savory…or a bit of both, the real treat is the journey you’ve just had. Because it’s one you’ll never forget.